Practical guide for developmentally appropriate, student-centered mathematics instruction from best selling mathematics methods authors John Van de Walle, Karen Karp, LouAnn Lovin, and Jennifer Bay-Williams. Initially adapted from Van de Walle’s market-leading textbook, Elementary and Middle School Mathematics, the Professional Mathematics Series is specially designed for in-service teachers. Each volume of the series focuses on the content relevant to a specific grade band and provides additional information on creating an effective classroom environment, engaging families, and aligning teaching to the Common Core State Standards. Additional activities and expanded lessons are also included. Volume II is tailored specifically to grades 3-5, allowing teachers to quickly and easily locate information to implement in their classes. 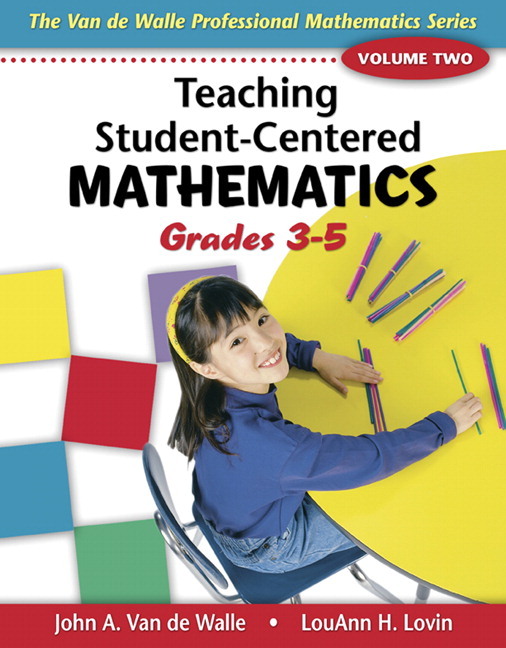 The student-centered approach will result in students who are successful in learning mathematics, making these books indispensable for 3-5 classroom teachers! Click here to see what's new in this edition! Includes practical take-away ideas that can support the teaching and learning of specific chapter content. These might be an instructional suggestion, a particular point about language use, a common student misconception, or a suggestion about a resource. See the new Teaching Tips. Helps teachers plan their instruction around “big ideas” rather than isolated skills or concepts. At the beginning of each chapter in Part II, the key mathematical ideas associated with the chapter are listed. These lists of learning targets can help teachers get a snapshot of the mathematics they are teaching. Includes numerous problem-based activities. These high quality tasks are presented in numbered Activity boxes and many have new adaptation and accommodation suggestions for English Language Learners and Students with Special Needs. The Activities at a Glance table in the Preface lists all the named and numbered activities with a short statement of the mathematical goal for each and the page where the activity can be located. Provides examples of activities developed into full lessons. At the ends of each Part II chapter, the authors expanded one activity into a complete lesson plan, following the Before-During-After structure described in Chapter 2. In this new edition, all lessons are aligned with NCTM’s Curriculum Focal Points and Common Core State Standards grade level recommendations and include adaptation suggestions for English Language Learners and Students with Special Needs. Improves teachers’ understanding of formative assessment. Effective assessment identifies and then targets student needs through instruction. Formative Assessment Notes provide suggestions of what assessment tasks to use with students and what to listen and look for in different areas of content development. Provides practical information about how technology can be used to help students learn the content. Technology Notes describe free resources like include open-source software, interactive applets, and other Web-based resources to enhance student learning opportunities. Supports reflective thinking, the key to effective learning. Stop and Reflect sections ask teachers to solve a problem or reflect on some aspect of what they have read to help reinforce important points. Illustrates the Common Core State Standards in action. Connections to the eight Standards of Mathematical Practice from the Common Core State Standards are highlighted in the margins. The location of the note indicates an example of the identified practice in the nearby text. Since the writing of the First Edition many developments in mathematics education have occurred— from the publication of NCTM’s Curriculum Focal Points (2006) to the development and implementation of the Common Core State Standards (CCSSO, 2010). Research has provided new information about how students learn particular mathematical ideas. Readers have also provided feedback about what they wished was in the First Edition. It was time to incorporate these ideas into a new edition to ensure teachers had access to strong support aligned with the latest developments in mathematics education. A more in-depth definition of understanding using the eight mathematical practices identified in the Common Core State Standards (CCSSO, 2010), the five strands of mathematical proficiency from Adding It Up (NCTM, 2001), and NCTM’s process standards (2000) (Chapter 1). 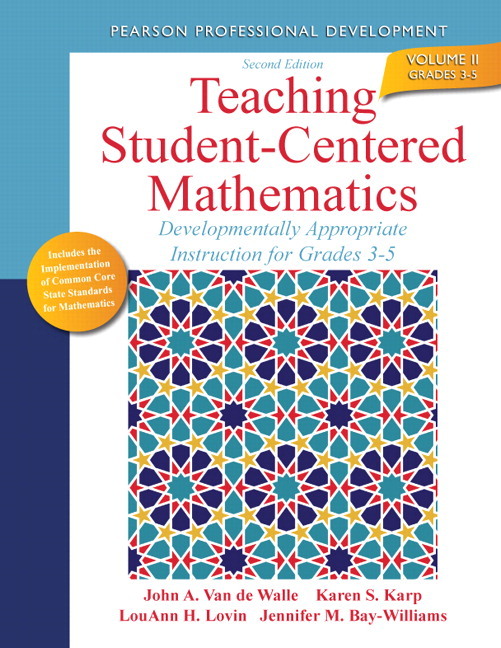 Standards for Mathematical Practice,a critical component of the CCSS recommendations, are highlighted in the text through marginal notes and focus readers’ attention on examples of what these eight practices look like across content areas and grade levels. Chapters have been reorganized and updated to reflect the CCSS recommendations and present a more coherent progression of mathematical ideas and student learning. Explicit and specific attention is given to grade level positioning of content throughout the discussion within each chapter. Increased Attention to Student Diversity. A new emphasis on diversity can be seen with the addition of chapters on differentiating instruction (Chapter 4) as well as planning, teaching, and assessing culturally and linguistically diverse students (Chapter 5) and students with exceptionalities (Chapter 6). Additional strategies for supporting students with special needs and English Language Learners are included in Part II chapters, highlighted in several activities in each chapter (noted with icons), and are incorporated into the revised expanded lessons at the end of each Part II chapter. Coverage of Technology. Since the First Edition published, technology has changed drastically. Now there is an increased availability of high quality web sites, applets, freeware, and so on. Each chapter in Part II identifies effective, free technology that can help make content more visible, relevant, and interesting to students. Revised, Updated Expanded Lessons. Every Part II chapter still has a lesson at the end, but they have all been revised. All lessons now include (1) NCTM and CCSS grade level recommendations, (2) adaptation suggestions for English Language Learners and Students with Special Needs, and (3) formative assessment suggestions for what to observe and what to ask students. The late John Van de Walle was a professor emeritus at Virginia Commonwealth University. He was a mathematics education consultant who regularly gave professional development workshops for K-8 teachers in the United States and Canada. He visited and taught in elementary school classrooms and worked with teachers to implement student-centered math lessons. He co-authored the Scott Foresman-Addison Wesley Mathematics K-6 series and contributed to the Pearson School mathematics program, enVisionMATH. Additionally, he wrote numerous chapters and articles for the National Council of Teachers of Mathematics (NCTM) books and journals and was very active in NCTM, including serving on the Board of Directors, Chair of the Educational Materials Committee, and a frequent speaker at national and regional meetings. Karen S. Karpis a professor of mathematics education at the University of Louisville (Kentucky). Prior to entering the field of teacher education she was an elementary school teacher in New York. Karen’s research interests is on teaching mathematics to diverse populations. She is also co-author of Elementary and Middle School Mathematics: Teaching Developmentally, Growing Professionally: Readings from NCTM Publications for Grades K-8, Developing Essential Understanding of Addition and Subtraction for Teaching Mathematics in Pre-K-Grade 2 and numerous book chapters and articles. She is a former member of the Board of Directors of the National Council of Teachers of Mathematics (NCTM) and a former president of the Association of Mathematics Teacher Educators (AMTE). She continues to work in classrooms to support teachers of students with disabilities in their mathematics instruction. LouAnn Lovin is a professor of mathematics education at James Madison University (Virginia). She co-authored the First Edition of the Teaching Student-Centered Mathematics Professional Development Series with John A. VandeWalle as well as Teaching Mathematics Meaningfully: Solutions for Reaching Struggling Learners with special educators David Allsopp and Maggie Kyger. LouAnn taught mathematics to middle and high school students before transitioning to PreK-8. Over the last 15 years, she has worked in K-8 classrooms and engaged with teachers in professional development as they implement a student-centered approach to teaching mathematics. She has published articles in NCTM’s Teaching Children Mathematics and Mathematics Teaching in the Middle School and has served on NCTM’s Educational Materials Committee.LouAnn’s research interest is on ways to develop teachers’ mathematical knowledge needed to teach for understanding. Jennifer Bay-Williams is a professor of mathematics education at the University of Louisville (Kentucky). Jennifer has published many articles on teaching and learning in NCTM journals. She has also coauthored numerous books, including: Mathematics Coaching: Tools and Resources for Coaches and Leaders, K-12; Developing Essential Understanding of Addition and Subtraction for Teaching Mathematics in Pre-K-Grade 2, Math and Literature: Grades 6-8, Math and Nonfiction: Grades 6-8, and Navigating through Connections in Grades 6-8. Jennifer taught elementary, middle, and high school in Missouri and in Peru, and continues to work in classrooms at all levels with students and with teachers. Jennifer served as member of Board of Directors for TODOS: Equity for All, as president of the Association of Mathematics Teacher Educators (AMTE), and editor for the 2012 NCTM Yearbook.